To be honest, Christmas Eve Eve wasn't super "wow", nor super "last-minute-Christmas shopping hectic"... it was quite like a normal "home day". For some reason, if we're home on Saturdays, I tend to spend most of it cooking and baking. Not that I don't enjoy doing both, but I do wish I could get to something else in the house. I really must strive to do that. My day started at the gym with my friend - an arm and shoulder workout. A few hours later, at about 9:30, I left my local Morrisons shop this morning with a smile on my face. After having been there since 7:50, having spent the majority of it waiting for my Christmas order, I could have very, very easily left feeling very upset. Instead, I had received FANTASTIC customer service just minutes before. For a second year, I made a Christmas order from Morrison's - a ham, a pork pie for Jeff, a Christmas tree cake and a robin cake - yep, two cakes. I selected the 8:30 pickup time, but arrived at Morrison's just before 8:00am to get a few more things to "survive" through Boxing Day. At about 8:40, while I was bagging my groceries at the checkouts, I looked to my left and noticed a queue of customers. It was customers waiting for their Christmas orders. "Oh, great, it's happened again", I thought. Just like last year, the delivery was late, so staff were scrambling to get the orders together. I went over to Customer Services to enquire about my order. The young man behind the counter told me the lorry was late, so the orders weren't ready, but I was welcome to have a complimentary tea or coffee in the cafe. I was actually impressed that the staff already had a plan to appease the customers while they waited for their orders. I got my cappuccino and waited about 5 minutes in the cafe, then the same young man came over to tell me that my order was ready. I joined the queue and waited... and waited... and waited. As you can imagine, I became more agitated as I waited and was asked my surname numerous times. The queue thinned out and I was the last one standing there. I received numerous apologies but still no order. Finally the customer services manager came over to find out what I was doing still standing there. I explained that I understand that the lorry was late to arrive, but the disorganization and the lack of staff to help sort it out was simply not good enough. Somehow I remained calm while the refrigerated and frozen items I bought slowly came to room temperature in my shopping bags. 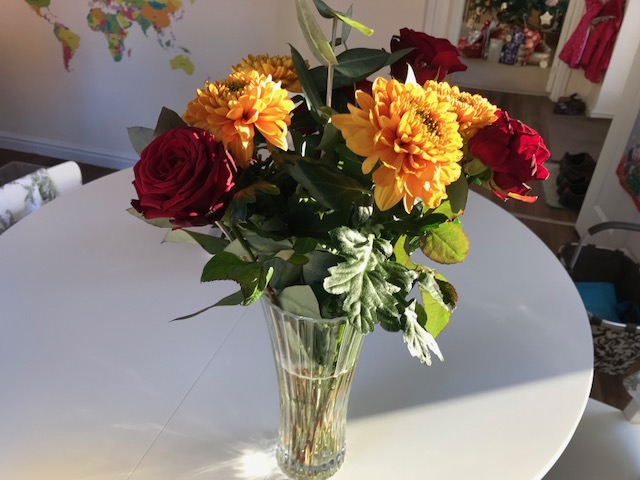 The customer services manager surprised me by offering me a bouquet of flowers and a bottle of Cava "to put a smile on my face". I thanked her, but said that I'd rather have a small discount off the remainder of my order. When I placed the order, I paid a £20 deposit. She walked away and came back moments later with a lovely bouquet. When another member of staff brought my order up in a large box, she explained that the pork pie I had ordered hadn't come in, so they replaced it with another one. "I sure hope they don't charge me for that pork pie after waiting all that time", I thought. A £10 pork pie for free would be nice! The customer services manager then rang through most of the items, except the pork pie and the partially-thawed bag of peas I grabbed while I was waiting. £35-something rang up on the till, but she said that she didn't want me to pay for it. Twenty pounds would have come off that for the deposit, but she gave me at least £15 worth of food for free plus the lovely bouquet! She told me she wanted me to walk out of there with a smile on my face. I thanked her and walked out slightly embarrassed for being doted upon. Once I got home - and calmed down a hysterical 3-year-old - I made a small batch of my slow cooker bolognese. 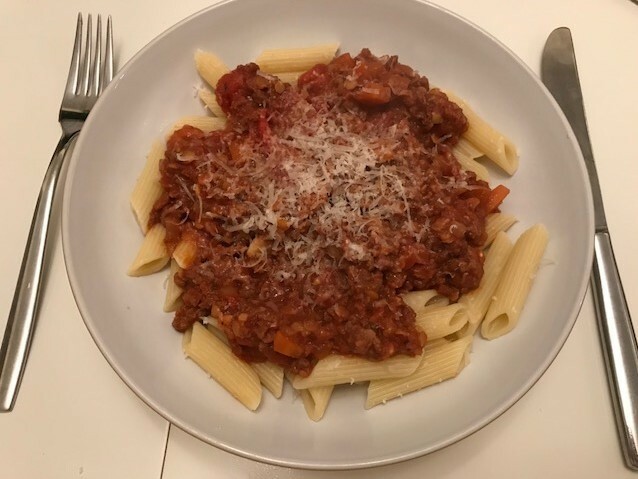 This is the link to the recipe: http://littlespicejar.com/slow-cooker-bolognese-sauce/, but I don't follow it to a "t". I also add probably 1/2 a cup of lentils to the bolognese not only to add a bit of fibre to the sauce but to "bulk out" the ground beef/mince. Sometimes I add the cream, sometimes I don't. 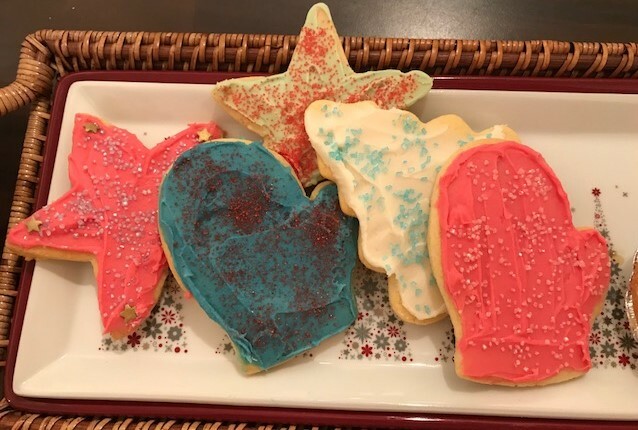 The kids and I made cut-out Christmas cookies today after lunch, which I do enjoy, but admittedly, it is slightly frustrating. The main thing is that the girls enjoy it and we have delicious cookies ready for Santa's arrival. Our friends visited this afternoon for a short while, which is always nice, but always too short. We've always been touched by their thoughtfulness and generosity. Fast forward to now, and this is my view. 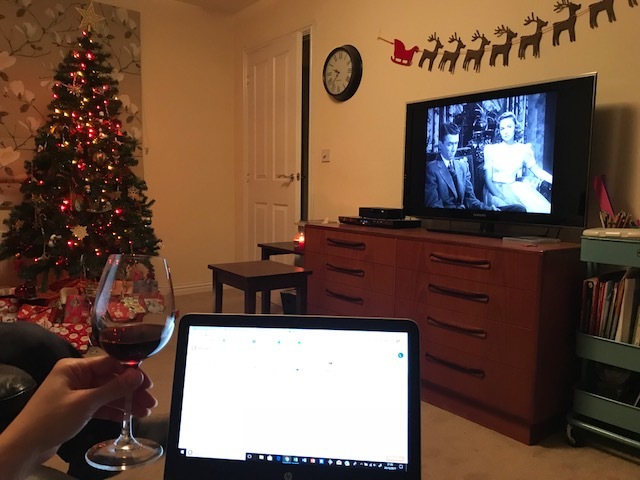 A simple, cosy evening. Jeff and I are watching "It's a Wonderful Life", the Yankee candle my friend surprised me with lit in the background. I'm sitting in our comfy recliner typing this post and while sipping a small glass of Chilean Merlot that was leftover from my work's Christmas party. "Every time a bell rings, an angel gets his wings", George Bailey's little daughter says in his arms in the last scene of the film. George's house is filled by the people whose life he's impacted and for whom he is so grateful. I am grateful for your support of my blog and want to wish you and your family a very merry Christmas.